For the Italian film, see Anthony of Padua (film). For others known as Saint Anthony, see Saint Anthony. Fernando Martins de Bulhões was born in Lisbon, Portugal. While 15th-century writers state that his parents were Vicente Martins and Teresa Pais Taveira, and that his father was the brother of Pedro Martins de Bulhões, the ancestor of the Bulhão or Bulhões family, Niccolò Dal-Gal views this as less certain. His wealthy and noble family arranged for him to be instructed at the local cathedral school. At the age of 15, he entered the community of Canons Regular of the Order of the Holy Cross at the Augustinian Abbey of Saint Vincent on the outskirts of Lisbon. In 1212, distracted by frequent visits from family and friends, he asked to be transferred to the motherhouse of the congregation, the Monastery of the Holy Cross in Coimbra, then the capital of Portugal. There, the young Fernando studied theology and Latin. In Alvise Vivarini's painting, Anthony is distinguished from the other saints by his attributes, the book and the white lily stalk. After his ordination to the priesthood, Fernando was named guestmaster and placed in charge of hospitality for the abbey. While he was in Coimbra, some Franciscan friars arrived and settled at a small hermitage outside Coimbra dedicated to Saint Anthony of Egypt. Fernando was strongly attracted to the simple, evangelical lifestyle of the friars, whose order had been founded only 11 years prior. News arrived that five Franciscans had been beheaded in Morocco, the first of their order to be killed. King Afonso ransomed their bodies to be returned and buried as martyrs in the Abbey of Santa Cruz. Inspired by their example, Fernando obtained permission from church authorities to leave the Canons Regular to join the new Franciscan order. Upon his admission to the life of the friars, he joined the small hermitage in Olivais, adopting the name Anthony (from the name of the chapel located there, dedicated to Saint Anthony the Great), by which he was to be known. Anthony then set out for Morocco, in fulfillment of his new vocation. However, he fell seriously ill in Morocco and set sail back for Portugal in hope of regaining his health. On the return voyage, the ship was blown off course and landed in Sicily. From Sicily, he made his way to Tuscany, where he was assigned to a convent of the order, but he met with difficulty on account of his sickly appearance. He was finally assigned to the rural hermitage of San Paolo near Forlì, Romagna, a choice made after considering his poor health. There, he had recourse to a cell one of the friars had made in a nearby cave, spending time in private prayer and study. One day in 1222, in the town of Forlì, on the occasion of an ordination, a number of visiting Dominican friars were present, and some misunderstanding arose over who should preach. The Franciscans naturally expected that one of the Dominicans would occupy the pulpit, for they were renowned for their preaching; the Dominicans, though, had come unprepared, thinking that a Franciscan would be the homilist. 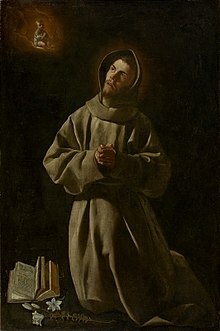 In this quandary, the head of the hermitage, who had no one among his own humble friars suitable for the occasion, called upon Anthony, whom he suspected was most qualified, and entreated him to speak whatever the Holy Spirit should put into his mouth. Anthony objected, but was overruled, and his sermon created a deep impression. Not only his rich voice and arresting manner, but also the entire theme and substance of his discourse and his moving eloquence, held the attention of his hearers. Everyone was impressed with his knowledge of scripture, acquired during his years as an Augustinian friar. At that point, Anthony was sent by Brother Gratian, the local minister provincial, to the Franciscan province of Romagna, based in Bologna. He soon came to the attention of the founder of the order, Francis of Assisi. Francis had held a strong distrust of the place of theological studies in the life of his brotherhood, fearing that it might lead to an abandonment of their commitment to a life of real poverty. In Anthony, however, he found a kindred spirit for his vision, who was also able to provide the teaching needed by young members of the order who might seek ordination. In 1224, he entrusted the pursuit of studies for any of his friars to the care of Anthony. The reason St. Anthony's help is invoked for finding things lost or stolen is traced to an incident that occurred in Bologna. According to the story, Anthony had a book of psalms that was of some importance to him, as it contained the notes and comments he had made to use in teaching his students. A novice who had decided to leave took the psalter with him. Prior to the invention of the printing press, any book was an item of value. Upon noticing it was missing, Anthony prayed it would be found or returned. The thief was moved to restore the book to Anthony and return to the order. The stolen book is said to be preserved in the Franciscan friary in Bologna. Occasionally, he took another post, as a teacher, for instance, at the universities of Montpellier and Toulouse in southern France, but as a preacher Anthony revealed his supreme gift. According to historian Sophronius Clasen, Anthony preached the grandeur of Christianity. His method included allegory and symbolical explanation of Scripture. In 1226, after attending the general chapter of his order held at Arles, France, and spreading the word of the lord in the French region of Provence, Anthony returned to Italy and was appointed provincial superior of northern Italy. He chose the city of Padua as his location. In 1228, he served as envoy from the general chapter to Pope Gregory IX. At the papal court, his preaching was hailed as a "jewel case of the Bible" and he was commissioned to produce his collection of sermons, Sermons for Feast Days (Sermones in Festivitates). Gregory IX himself described him as the "Ark of the Testament" (Doctor Arca testamenti). Anthony became sick with ergotism in 1231, and went to the woodland retreat at Camposampiero with two other friars for a respite. There, he lived in a cell built for him under the branches of a walnut tree. Anthony died on the way back to Padua on 13 June 1231 at the Poor Clare monastery at Arcella (now part of Padua), aged 35. According to the request of Anthony, he was buried in the small church of Santa Maria Mater Domini, probably dating from the late 12th century and near a convent which had been founded by him in 1229. Nevertheless, due to his increased notability, construction of a large basilica began around 1232, although it was not completed until 1301. The smaller church was incorporated into structure as the Cappella della Madonna Mora (Chapel of the Dark Madonna). The basilica is commonly known today as "Il Santo". Various legends surround the death of Anthony. One holds that when he died, the children cried in the streets and that all the bells of the churches rang of their own accord. Another legend regards his tongue. Anthony is buried in a chapel within the large basilica built to honor him, where his tongue is displayed for veneration in a large reliquary along with his jaw and his vocal cords. When his body was exhumed 30 years after his death, it was found turned to dust, but the tongue was claimed to have glistened and looked as if it were still alive and moist; apparently a further claim was made that this was a sign of his gift of preaching. On 1 January 1981, Pope Saint John Paul II authorized a scientific team to study the saint's remains and the tomb was opened on 6 January. Anthony was canonized by Pope Gregory IX on 30 May 1232, at Spoleto, Italy, less than one year after his death. Anthony's fame spread through Portuguese evangelization, and he has been known as the most celebrated of the followers of Saint Francis of Assisi. He is the patron saint of Lisbon, Padua and many places in Portugal and in the countries of the former Portuguese Empire. He is especially invoked and venerated all over the world as the patron saint for the recovery of lost items and is credited with many miracles involving lost people, lost things and even lost spiritual goods. In 1692, Spanish missionaries came across a small Payaya Indian community along what was then known as the Yanaguana River on the feast day of Saint Anthony, 13 June. The Franciscan chaplain, Father Damien Massanet, with agreement from General Domingo de Teran, renamed the rivers in his honor, and eventually a mission built nearby, as well. This mission became the focal point of a small community that eventually grew in size and scope to become the seventh-largest city in the country, the U.S. city of San Antonio, Texas. In New York City, the Shrine Church of St. Anthony in Greenwich Village, Manhattan celebrates his feast day, starting with the traditional novena of prayers asking for his intercession on the 13 Tuesdays preceding his feast. This culminates with a week-long series of services and a street fair. A traditional Italian-style procession is held that day through the streets of its South Village neighborhood, in which a relic of the saint is carried for veneration. Each year on the weekend of the last Sunday in August, Boston's North End holds a feast in honor of Saint Anthony. Referred to as the "Feast of All Feasts", Saint Anthony's Feast in Boston's North End was begun in 1919 by Italian immigrants from Montefalcione, a small town near Naples, where the tradition of honoring Saint Anthony goes back to 1688. Each year the Sandia Pueblo along with Santa Clara Pueblo celebrates the feast day of Saint Anthony with traditional Native American dances. On 27 January 1907, in Beaumont, Texas, a church was dedicated and named in honor of Saint Anthony. The church was later designated a cathedral in 1966 with the formation of the Roman Catholic Diocese of Beaumont, but was not formally consecrated. On 28 April 1974, St. Anthony Cathedral was dedicated and consecrated by Bishop Warren Boudreaux. In 2006, Pope Benedict XVI granted the cathedral the designation of minor basilica. St. Anthony Cathedral Basilica celebrated its 100th anniversary on 28 January 2007. 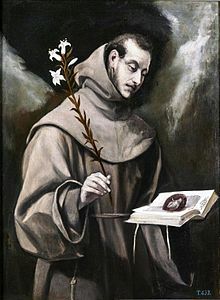 St. Anthony gives his name to Mission San Antonio de Padua, the third Franciscan mission dedicated along El Camino Real in California in 1771. In Ellicott City, Maryland, southwest of Baltimore, the Conventual Franciscans of the St. Anthony Province dedicated their old novitiate house as the Shrine of St. Anthony which since 1 July 2004 serves as the official shrine to Saint Anthony for the Archdiocese of Baltimore, the nation's "premier see" and oldest diocese/first bishop. A large relic of Saint Anthony was donated to the shrine in 1995 by the friars in Padua as well as copies of thirteen original paintings detailing particularly important moments in the life of St. Anthony. The Shrine of Saint Anthony is modeled upon the "Sacro Convento" in Assisi, Italy, and situated upon land once owned in a large estate by Charles Carroll of Carrollton, the only Roman Catholic signer of the Declaration of Independence for Maryland and then wealthiest man in America. Maryland had been founded as an English colony and a haven for Catholics in 1634. In addition to daily mass and regular confession schedule, the Shrine of St. Anthony also offers retreat spaces for outside guests and hosts an annual pilgrimage in mid-June in honor of the Feast Day of St. Anthony of Padua. Saint Anthony is known in Portugal, Spain, and Brazil as a marriage saint, because legends exist of him reconciling couples. His feast day, 13 June, is Lisbon's municipal holiday, celebrated with parades and marriages (the previous day, 12 June, is the Dia dos Namorados in Brazil). He is one of the saints celebrated in the Brazilian Festa Junina (also known as the "Santo Antônio"), along with John the Baptist and Saint Peter. He is venerated in Mogán Village in Gran Canaria, where his feast day is celebrated every year with oversized objects carried through the streets for the fiesta. In the town of Brusciano, Italy, located near Naples, an annual feast in honor of Saint Anthony is held in late August. This tradition dates back to 1875. The tradition started when a man prayed to Saint Anthony for his sick son to get better. He vowed that if his son would become healthy that he would build and dance a giglio like the people of Nola do for their patron San Paolino during the annual Fest Dei Gigli. (A giglio is a tall tower topped with a statue of the saint that is carried through the streets in carefully choreographed maneuvers that resemble a dance.) The celebration has grown over the years to include six giglio towers built in honor of the saint. This tradition has also carried over to America, specifically the East Harlem area of New York, where the immigrants from the town of Brusciano formed the Giglio Society of East Harlem and have been holding their annual feast since the early 1900s. In Poland, he is the patron saint of Przeworsk. The icon of Saint Anthony, dating from 1649, is housed in a local (Franciscan church, Kaplica Świętego Antoniego w Przeworsku [pl]). Devotion to Saint Anthony is popular throughout all of India. In Uvari, in Tamil Nadu, India, the church of Saint Anthony is home to an ancient wooden statue that is said to have cured the entire crew of a Portuguese ship suffering from cholera. Saint Anthony is said to perform many miracles daily, and Uvari is visited by pilgrims of different religions from all over South India. Christians in Tamil Nadu have great reverence for Saint Anthony and he is a popular saint there, where he is called the "Miracle Saint." Also in India, a small crusady known with the name of Saint Anthony is located in the village called Pothiyanvilai, state of Tamil Nadu Kanyakumari district near Thengapattinam, where thousands of devotees attend every Tuesday and Friday to receive his blessings, miracles, and guidings directly from St. Anthony's soul entering in the body of a holy person for the last 34 years. The southern Indian state of Karnataka is also a holy pilgrimage center in honor of Saint Anthony (specifically located in the small village of Dornahalli, near Mysore). Local lore holds that a farmer there unearthed a statue that was later identified as being that of Saint Anthony. The statue was deemed miraculous and an incident of divine intervention. A church was then erected to honor the saint. Additionally, Saint Anthony is highly venerated in Sri Lanka, and the nation's Saint Anthony National Shrine in Kochikade, Colombo, receives many devotees of Saint Anthony, both Catholic and non-Catholic. In the Philippines, the devotion to St. Anthony of Padua began in 1581, in the town of Pila, Laguna, where Franciscans established the first church in the country dedicated to St. Anthony of Padua, now elevated as the National Shrine of St. Anthony of Padua under the Diocese of San Pablo. In Siolim, a village in the Indian state of Goa, St. Anthony is always shown holding a serpent on a stick. This is a depiction of the incident which occurred during the construction of the church wherein a snake was disrupting construction work. The people turned to St. Anthony for help and placed his statue at the construction site. The next morning, the snake was found caught in the cord placed in the statue's hand. As the number of Franciscan saints increased, iconography struggled to distinguish Anthony from the others. Because of a legend that he had once preached to the fish, this was sometimes used as his attribute. He is also often seen with a white lily stalk, representing his purity. Other conventions referred to St. Anthony's visionary fervor. Thus, one attribute in use for some time was a flaming heart. In 1511, Titian painted three large frescoes in the Scuola del Santo in Padua, depicting scenes of the miracles from the life of Saint Anthony: The Miracle of the Jealous Husband, which depicts the murder of a young woman by her husband; A Child Testifying to Its Mother's Innocence; and The Saint Healing the Young Man with a Broken Limb. Another key pattern has him meditating on an open book in which the Christ Child himself appears, as in the El Greco above. Over time the child came to be shown considerably larger than the book and some images even do without the book entirely. He typically appears carrying the infant Jesus and holding a cross. The 1931 silent film Saint Anthony of Padua (Antonio di Padova, il santo dei miracoli) was directed by Giulio Antamoro. He was played in the 1949 Italian film Anthony of Padua by Aldo Fiorelli. Umberto Marino's 2002 Sant'Antonio di Padova or Saint Anthony: The Miracle Worker of Padua is an Italian TV movie about the saint. While the VHS format is without English subtitles, the DVD version released in 2005 is simply called Saint Anthony and is subtitled. Antonello Belluco's 2006 Antonio guerriero di Dio or Anthony, Warrior of God is a biopic about the saint. João Pedro Rodrigues directed the 2016 film The Ornithologist, a sort of modern-day fantastic allegory of the life of St. Anthony. ^ Purcell, Mary (1960). Saint Anthony and His Times. Garden City, New York: Hanover House. pp. 19, 275–6. ^ a b c Dal-Gal, Niccolò (1907). 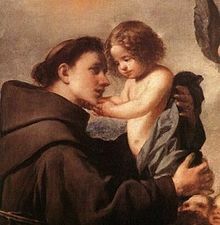 "St. Anthony of Padua". The Catholic Encyclopedia. 1. Robert Appleton Company. Retrieved 13 June 2011. ^ a b c Monti, Dominic V. (O.F.M.) (2008). Francis and His Brothers. A Popular History of the Franciscan Friars. Cincinnati, Ohio: Franciscan Media. ISBN 978-0-86716855-6. Excerpt. Retrieved 5 April 2017. ^ a b Foley, Leonard. "Who Is St. Anthony?". American Catholic. Archived from the original on 17 October 2000. Retrieved 27 June 2011. ^ Pope Benedict XVI (10 February 2010). "GENERAL AUDIENCE". Vatican City: Holy See. Retrieved 15 November 2016. ^ "Skeleton of St Anthony goes on display to public more than 750 years after his death". Daily Mail. 15 February 2010. Retrieved 29 March 2011. ^ "When Anthony spoke again". Messenger of Saint Anthony. Archived from the original on 2 April 2015. Retrieved 21 March 2015. ^ Pope Benedict XVI (10 February 2010). "GENERAL AUDIENCE". Retrieved 13 June 2013. Chisholm, Hugh, ed. (1911). "Anthony of Padua, Saint" . Encyclopædia Britannica (11th ed.). Cambridge University Press. ^ "San Antonio: The City of St. Anthony". St. Anthony Messenger Magazine Online. Americancatholic.org. June 2004. Retrieved 30 June 2010. ^ "Mass Schedule". stanthonynyc.org. Archived from the original on 5 November 2009. ^ Aluia, Jason (19 August 2013). "94th St. Anthony's Feast Schedule Highlights – Friday, August 23 – Monday, August 26, 2013". North End Waterfront.com. Retrieved 29 August 2013. ^ Sweet, Jill Drayson (2004). Dances of the Tewa Pueblo Indians: expressions of new life. Santa Fe: School of American Research Press. ISBN 978-1-930618-29-9. ^ Media, Mogan. "Church of San Antonio El Chico". www.moganguide.com. ^ "Siolim The Village Everyone Loves | St.Mary's Goan Community Dubai". 6 June 2012. Archived from the original on 11 January 2014. ^ Morosini, Sergio Rossetti (March 1999). "New Findings in Titian's Fresco Technique at the Scuola del Santo in Padua". The Art Bulletin. 81 (1): 163–164. doi:10.1080/00043079.1999.10786878 (inactive 13 March 2019). ^ Chong, Alan, ed. Christianity in Asia: Sacred Art and Visual Splendour. Printed in Singapore for the Asian Civilisations Museum: Dominie Press, 2016, p. 189. ^ Sant'Antonio di Padova aka Saint Anthony: The Miracle Worker of Padua at IMDb. ^ DVD on Amazon with English subtitles. ^ Antonio guerriero di Dio aka Anthony, Warrior of God at IMDb. "St Anthony of Padua – St Peter's Square Colonnade Saints"
"Saint Anthony of Padua". Invisible Monastery of charity and fraternity - Christian family prayer. Archived from the original on 23 February 2018.